Glance into the gaming-est corners of the internet and you'll see that No Man's Sky is, apparently, back. Or it could be more accurate to say the game, which was released to pretty widespread disappointment a year ago, has finally arrived. 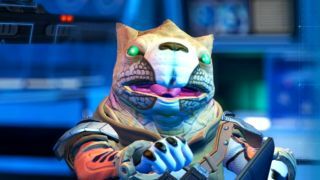 No Man's Sky's Atlas Rises update has players excitedly exploring heretofore unseen biomes and coming to grips with a new storyline (not to mention appreciating all the previous updates that relatively few stuck around to see). This Reddit user summed it up pretty well. And Twitter seems pretty happy about it too. Even notoriously fickle Steam ratings are coming around. You know you've finally managed to placate your player base if things are going well there. I only played a few hours of No Man's Sky in the weeks after it came out and I liked it (not enough to stick with it, obviously). But I could have easily gone the other way if I hadn't consciously set my expectations to "sci-fi chillout game" rather than "limitless online universe" as much of the pre-release hype had indicated. No amount of discrepancy between promise and product could excuse the cruel ways some disappointed players reacted, of course, but that old venom does make these fresh, happy reactions feel all the more heartening. Good job sticking with it, Hello Games! Still not sure what the big deal is? Follow the year-long arc to redemption with our original No Man's Sky review and these looks at the Foundation update and the Path Finder update.